Allen & Heath has announced that a range of DEEP processing plugins is now available as optional add-ons for its SQ Series. 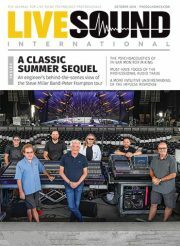 The new options allow SQ users to choose from a suite of plugins ported directly from Allen & Heath’s flagship dLive mixing system, including compressors inspired by hardware units and a collection of GEQs. Thanks to SQ’s 96kHz XCVI core, based on latest generation FPGA technology, a preamp and compressor plugin can be used on each of the 48 input channels, while a GEQ and compressor can be applied to each of the 16 mixes. DEEP plugins are built in to the console architecture and add no additional latency to the system, ensuring phase coherency across channels and mixes. A Tube Stage Preamp plugin (worth $149 USD) is free to all SQ users, and additional plugins start at $59 USD, all available directly from shop.allen-heath.com.